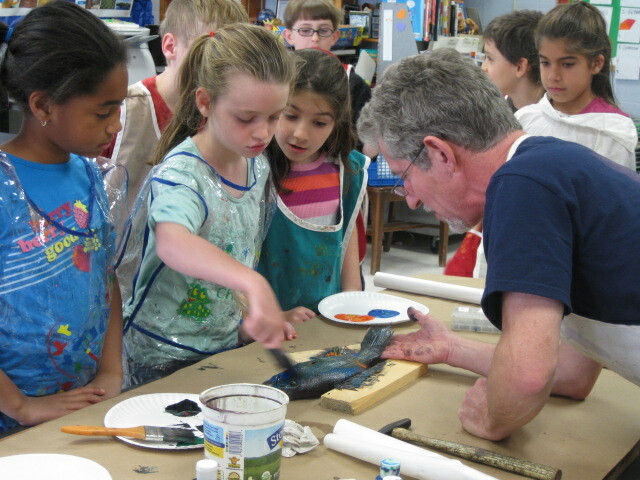 This method of printing allows for excellent educational workshops at both the elementary school level and the high school level. It allows me to discuss both sustainability issues as well as instructing students on print making. Freshly caught specimens will be used to discuss the types of fish that can be found in local waters whether it be the Hudson River or the Long Island Sound. 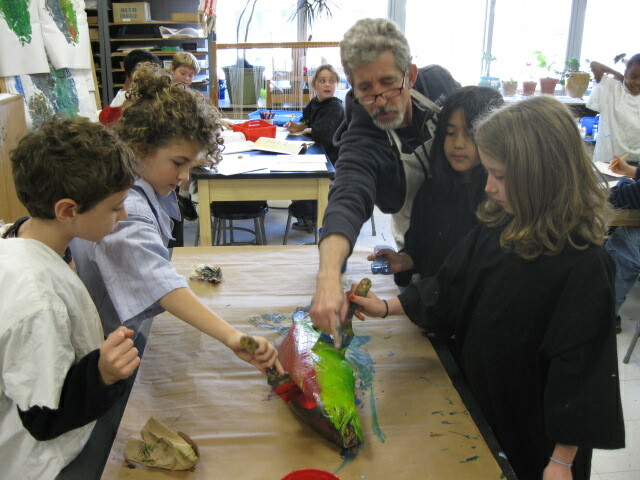 In my workshops, every student participates in a hands on gyotaku session. The rubbings are made on a quality mulberry paper and can be mounted on board or plexi glass that makes a beautiful translucent image. These rubbings can also be used in collages as a class project. The gyotaku process can also be applied to t-shirts and most any type of fabric. This works well indoors as well as outside for a field day type activity. For information about these workshops, contact Joe Mullins at (914) 271-1214. Above, I am discussing the spiny dorsal on a Black sea bass from Long Island Sound. 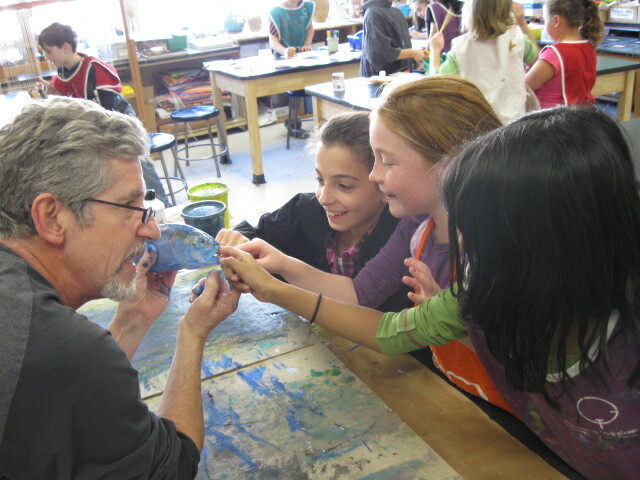 These 3rd graders get ready to make a rubbing from a Black sea bass. 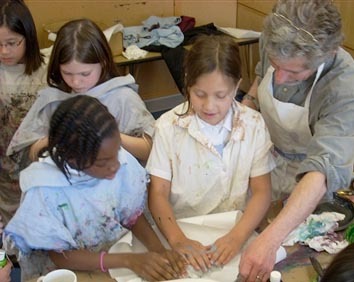 Every student gets a hands on experience in this process. This method of mono printing creates some powerful images. 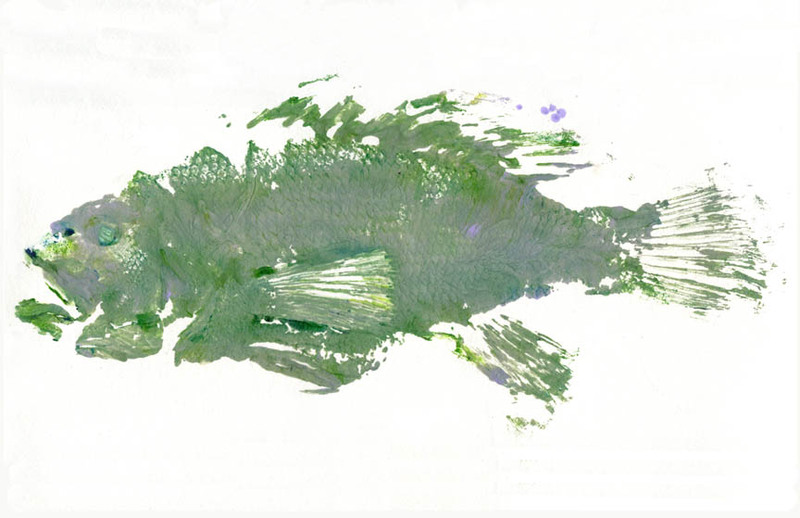 At the Convent of the Sacred Heart in Greenwich CT, we worked with Black Sea Bass from Long Island Sound (below). 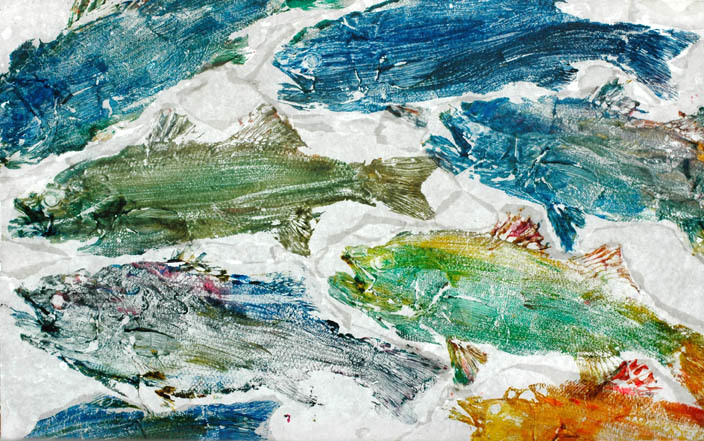 Here is a rubbing one of the students made. We framed it and it is in their library now. 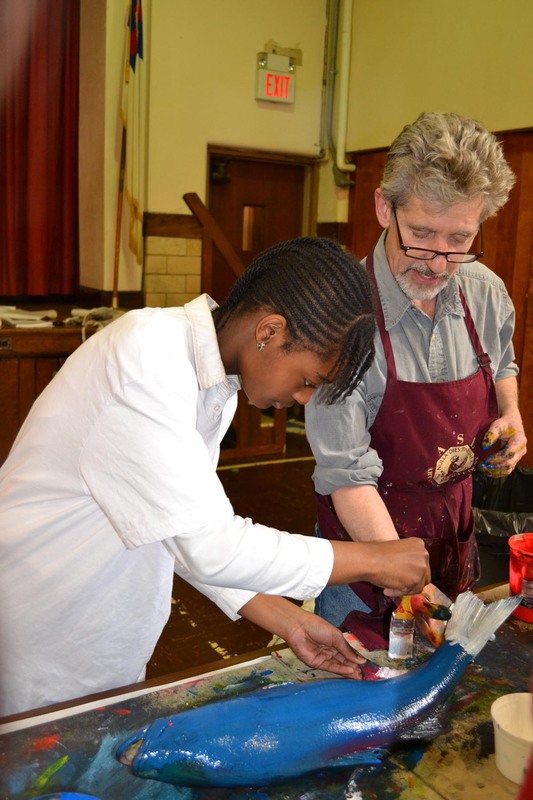 At a one day workshop at St Marks in Yonkers NY I did a session that covered several grades. Below are some of the students and their work. The featured fish was a very large Striped bass that I caught in the Hudson. It was fun talking to the students about the catch. 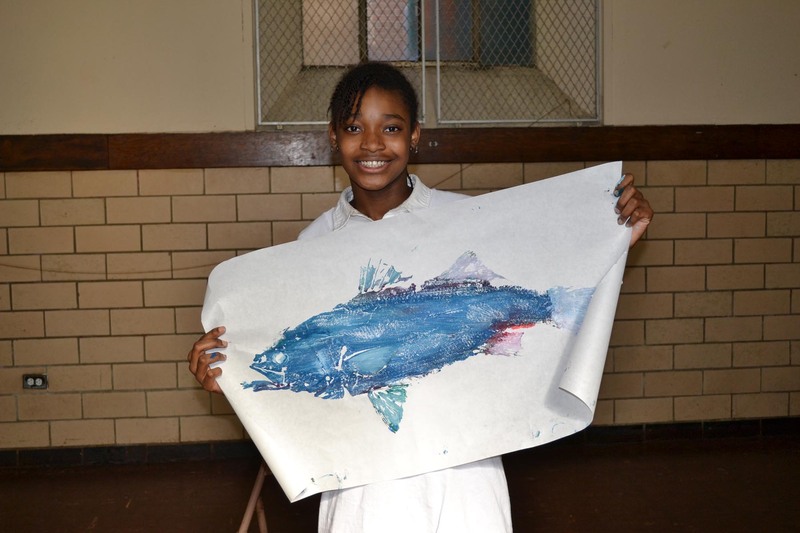 The students made many extra rubbings that I used to create a large collage of migrating Striped bass. The collage was than mounted onto clear plexi glass using a UV gel, it created a large beautiful transparent light weight window that went into a major art sho at ArtsWestchester. The show than traveled to the Mt Vernon City Hall. The transparent image below is 5.5′ X 4.5′. 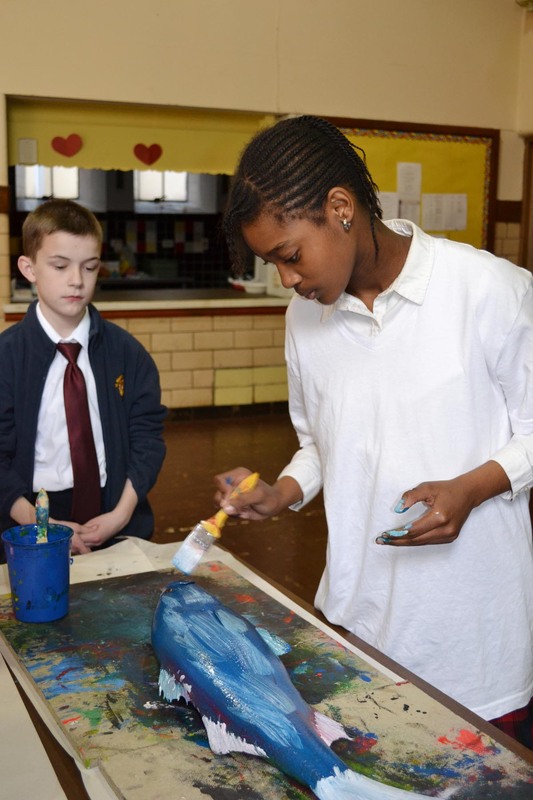 The art will make a home at St Marks school. These prints were done by 3rd and 4th graders. I made a large collage and mounted on plexi. 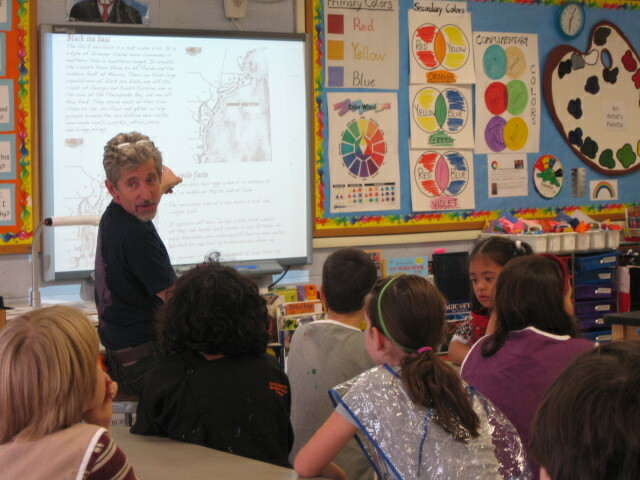 On the high school level I created a workshop for the AP Art Students at Croton on Hudson NY.